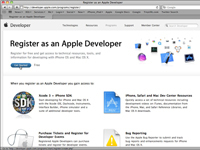 If you want to submit iPad apps to Apple, you must become an Apple Registered Developer and obtain your Apple ID. If you don’t want to join the Developer Program right away, you can register first for free, and then join later when you’re ready to pay for the Program. 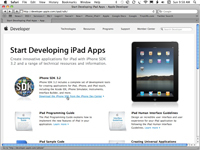 1Go to the Start Developing iPad Apps page of Apple's Web site. You should see a page with the SDK globe logo. Apple does change this site occasionally, so when you get there, it may be a little different than this figure. 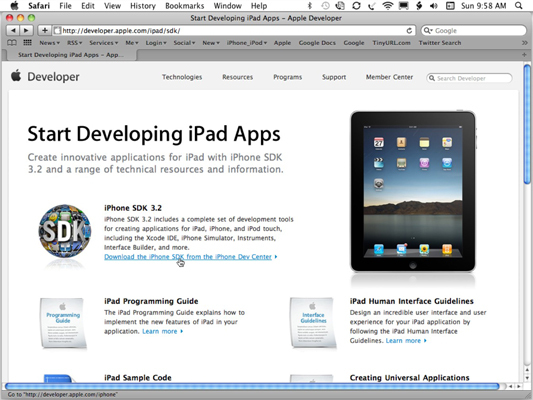 2Click the Download the iPhone SDK from the iPhone Dev Center link. 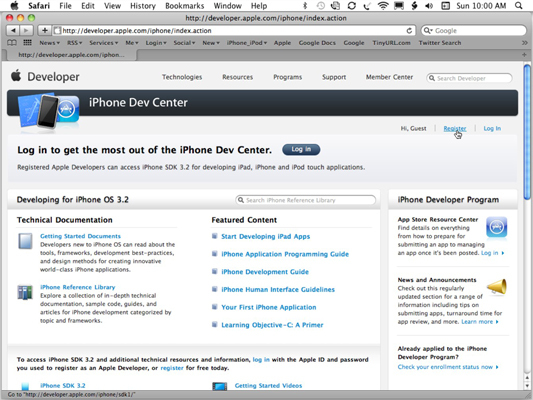 The iPhone Dev Center main page appears. You may be tempted by some of the links, but they get you only so far until you log in as a registered developer. 3Click the Register link in the top-right corner of the screen. 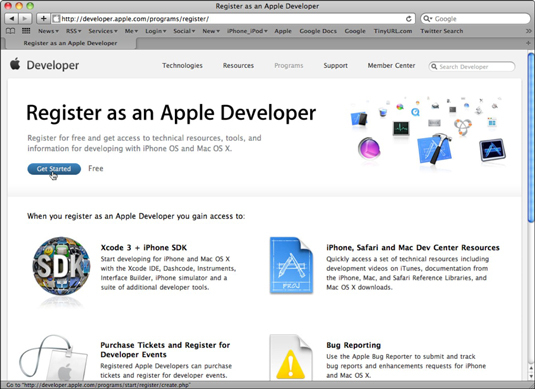 You see a page explaining why you should become a registered developer, as well as what Apple has to offer registered developers. A new page appears, asking whether you want to create a new Apple ID or use an existing one. 5If you don't have an Apple ID, select Create an Apple ID and click Continue. You find yourself at the Complete Your Personal Profile page, where you can enter your desired Apple ID and password. 6If you already have an Apple ID, select the Use an Existing Apple ID option, and then click Continue. You’re taken to a screen where you can log in with your Apple ID and password. That takes you to the Complete Your Personal Profile page with some of your information already filled out. 7Fill out the personal profile form, and then click Continue. If you have an Apple ID, most of the form is already filled out. You must fill in the country code in the phone number field. If you’re living in the United States, the country code is 1. 8Complete the next part of the form to finish your professional profile and then click Continue. You’re asked some basic business questions. Then you’re taken to yet another new page, which asks you to agree to the Registered iPhone Developer Agreement. 9Select the confirmation check box and click I Agree. This confirms that you have read and agree to be bound by the agreement and that you’re of legal age. If you just created your Apple ID, you’re asked for the verification code sent to the e-mail address you supplied when you created your Apple ID. If you used your existing Apple ID, you can jump to Step 11. 10Open the e-mail from Apple, enter the verification code, and click Continue. 11Click the Visit Phone Development Center button. 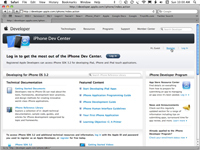 You’re automatically logged in to the iPhone Dev center.